As an author of historical fiction, I create characters and stories based on actual events because truth is so incredibly interesting. 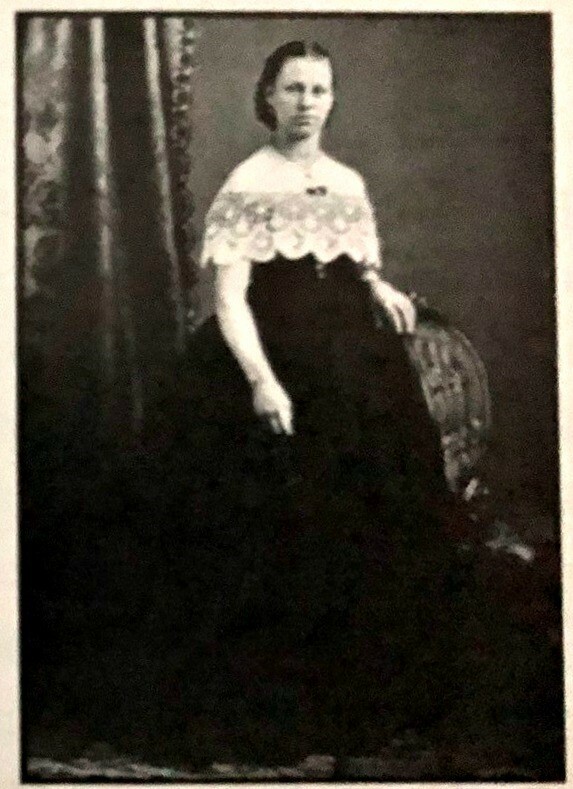 Take, for instance, a New Hampshire woman named Harriet, who, after a whirlwind courtship of eighteen years, married her blacksmith, poetry-writing, albeit in-no-hurry sweetheart, Anson Rudd, and struck out for California in 1859.
headed west from New Hampshire with her husband Anson. Photo courtesy of Royal Gorge Regional Museum and History Center. In those days, the West was indeed wild. No telephones, electricity, washing machines, or gas stoves. No running water. No bathrooms as we know them. Not many women traveled across the country at the time, watching the undulating rumps of horses, oxen, or mules from the wagon seat. But Harriet had waited eighteen long years for her beloved to fish or cut bait, and she wasn’t letting him out of her sight. After crossing endless plains, Harriet and her Anson reached the Rocky Mountains rising like a rampart before them. They camped at the mouth of a great canyon, next to the singing Arkansas River bordered by cottonwood trees and a meadow. Two cabins were already there. One was vacant, and they moved Harriet’s cook stove inside, right next door to the Middleton family who occupied the other cabin. Three days later on Sunday, a Southern Methodist minister fixed up a few boards in another cabin, and five souls met with the preacher to thank God for their safe passage – the first church service held in what was to become Cañon City, Colorado. An enterprising man by the name of Millet began publishing the Cañon City Times, a saw mill and several businesses went up, and the Mountain Ute tribe soon returned to their winter camp near the hot springs and mineral waters, where they found Harriet and her mouth-watering biscuits. They often came to her cabin and waited. Waited until she had time to stir up a batch of biscuits and pass them out to her native neighbors. One hundred and sixty years later, here I am writing not only historical fiction, but Western romance about people like Harriet and her Anson. Some folks argue that there was nothing remotely romantic about those early days of the West, but I disagree. Consider the smithy poet, Anson, who later had a cabin with a wooden floor built for his bride—the first cabin in Cañon City, it is said, to have a wooden floor. That doesn’t sound very romantic either, but consider the critters Harriet would have dealt with in those early, floor-less days: spiders, mice, scorpions, snakes, and other multi-legged creatures. Imagine keeping them out of one’s food, bed, and clothing. Actions have always spoken louder than words, and it sounds to me like Anson was a romantic man in love with his wife, and gladly went to the trouble of giving her a wooden floor. Royal Gorge Regional Museum and History Center. When the Rudd’s second child was born, Harriet gave the boy her maiden name as his middle name, a name I am particularly fond of—Spencer. Anson Spencer Rudd was reportedly the first Anglo child born in the area that survived. Anson and Harriet entertained all comers in those early years, including Territorial Governor John Evans. But Ute Chief Ouray was a frequent visitor and he developed a deep friendship with Anson. on the property of the Royal Gorge Regional Museum and History Center. Unlike many other villages in the territory, Cañon City was not a boom town springing up along a gold-scattered gully. There was no gold in Cañon City, but there was land in the area rich for farming crops and planting orchards. There was water and open grassland for herds of cattle and horses, and there were merchants ready and willing to load freight wagons that carried food and goods to the mountain mining camps. Life wasn’t easy, but it was good, the future bright. To keep the rowdies under control, Cañon City’s local leaders appointed a magistrate. A People’s Court was established, convening conveniently in the room above Bill Murray’s saloon. And Harriet had a few friends of her own. Out of a population of around 700, roughly 120 were women. What started out as a rendezvous site for hunters, trappers, and Native Americans prior to 1859 was, by 1861, an almost civilized town. But as sure as the promise of gold and prosperity lured miners to the gold camps and merchants to the great canyon gateway city, so the rumblings of civil war dragged them away, one man at a time. By late 1861, not only the leaves were falling around the town, so was the population. Anson, Harriet, and their family remained – whether out of desire or duress is uncertain. Some historians argue that Anson didn’t have the wherewithal to load up and head back to civilization. Others say he chose to maintain the feeble thread that would hold the settlement together. The deserted town stood eerily silent, with half-finished cabins and buildings, empty and lonely, until 1864 when a wagon train rolled into town with twenty or so families looking for a different kind of gold. Their names identify some of the city’s residential streets to this day. Cañon City officially incorporated in 1872, and the re-named Territory of Colorado became the 38th state in the Union four years later. The town had nearly died in its infancy – like Harriet and Anson’s first child – but it didn’t. Thanks to a couple who saw that Cañon City was worth fighting for. relocated to the property of the Royal Gorge Regional Museum and History Center. 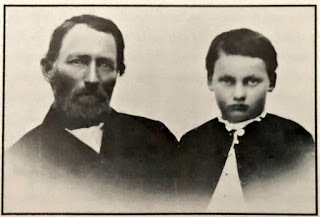 Although he was a blacksmith by trade, Anson served Cañon City as the first postmaster, though there was no post office, as provost marshal during the Civil War, warden of the Colorado Territorial Penitentiary, and later as the first sheriff of Fremont County. He also served two terms as county commissioner. All in all, I’d say Anson Rudd was well-chosen for all these positions, considering he knew how to keep both his wife and the Ute Indian chief happy. Davalynn Spencer is the award-winning author of eleven inspirational Western romance titles, both contemporary and historical. She is a former rodeo journalist, crime-beat reporter, and the wife and mother of professional rodeo bullfighters. When she’s not #lovingthecowboy, she’s wrangling Blue the Cowdog and mouse detectors Annie and Oakley. Contact her via her website at https://www.davalynnspencer.com. I love the picture of the Indians lounging around in the yard while Harriet made her biscuits! Thanks for the post! Yes, Connie, Harriet was a woman who stepped up to the challenge. Thanks for reading! Thanks for sharing. What a great historical story - I used to live in the Westcliffe area and visited Canon City frequently. I wish I had known some of this history then! Betti - I would love to live in Westcliffe, but I'd probably get nothing done because I'd just want to sit and look at the Sangre de Cristo mountains! In addition, one of the 20 families that landed in Canon City, was a man named Macon. I bought the home he built in 1889 on Macon Ave. He has quite the story as well. But, for now I have to tell a little story of my own about this Historic Macon house. The City Historian who made all our history at the museum happen, came to live in the Historic Macon carriage house in 2013-2015. So history continues thanks to Cara Fisher and she ended her time in Canon in the Historic setting she so loved for Canon City. A little piece of history for those reading this article. Linda Ballard, the Canon City Tea Lady from Macon Ave.
Linda - thank you so much for commenting today on this post. Yes, you are living the history here in Canon City in that glorious house. Thanks for sharing! I just love historical history and should have born years ago! Haha! Hahah - I know what you mean, Sonja! I love this story! American history fascinates me. Thank you for sharing the telling and the pictures.